A monk purposefully destroying a Mandala that took weeks to be built. Once upon a time, there was an old hard working farmer. One day his horse ran away. Upon hearing the news, his neighbors came to visit. “Such bad luck.” — they said sympathetically. “Maybe.” — The farmer replied. The next morning the horse returned, bringing with it three other wild horses. “How lucky you are.” — the neighbors exclaimed. “Maybe.” — Replied the old man. The following day, his son broke his leg trying to ride one of the untamed horses. The neighbors again came to offer their sympathy. “Maybe.” — Answered the farmer. The day after, military officials came to the village to draft young men into the army. Seeing that the son’s leg was broken, they passed him by. Once again, the neighbors told the farmer how lucky he was. “Maybe.” — Said the old man. This Zen Buddhist fable is powerful to understand the true nature of life: everything is impermanent. When you see reality through a “right or wrong” mindset, you get stuck in a moment. Being judgmental increases your suffering. Adopting a ‘maybe’ mindset will help you understand that nothing — both happiness and sadness—lasts forever. And increase your positivity. Life is neither good nor bad. When you label events, you turn them into either good or bad. When we judge what is happening to us, we become at war with reality. When things didn’t go as expected, we feel disappointed. And fight back. But things won’t change because you can’t accept them. Fighting reality will only turn you into a casualty. When you categorize incidents as either ‘good’ or ‘bad,’ you stop seeing the whole picture. Your life is not either wretched or perfect. ‘Good’ and ‘bad’ are interconnected; they are the two sides of the same coin. When you see life events as isolated, you jump from one emotion to another. (Like it happened to the farmer’s neighbors). However, when you understand that everything in life is intertwined, you stop reacting. Overall, the old man felt more positive by adopting a ‘maybe’ mindset. What you see is on you. Toni Morrison said: “Definitions belong to the definers, not the defined.” There are millions of events happening to you every day. When you label one incident as good or bad, you are saving it in your memory forever. You choose what you want to remember. Ruminating is an ineffective coping behavior, as I wrote here. The art of rehashing your memories — getting stuck in a particular moment — makes you a hostage of your past. You keep reliving a painful event unconsciously believing that you can change the outcome. That doesn’t mean that you shouldn’t keep memories. Your life is a movie. You should own the whole storyline, not just one or two scenes. Seeing life events as interconnected — rather than isolated — is liberating. When the farmer lost his horse, his neighbors felt pity for him — they thought destiny was punishing him. When everything unfolded to his favor, they called him lucky. However, luck is out of our control. It’s a welcoming tailwind. You cannot depend on it to move forward. That’s the problem with luck; we blame it when things go wrong and feel less about ourselves when things go well. Luck just happens, but life requires effort on your end. Everything that happens to you is the consequence of your behaviors. Life is a continuum where all your acts are intertwined. Your Karma is a byproduct of how you live, not of your luck. Karma is the law of moral causation. The inequality of humanity has a cause; it’s not driven by chance. It is the result of your past actions and present doings. You are responsible for your happiness and misery. You are the architect of your Karma. You build your own Heaven and Hell. Fate and Karma are related but are very much different. Karma is something that you get based on what you put out. It’s the results of your actions. Your destiny, on the contrary, is predetermined. You can’t escape your fate, but you can choose your actions — you forge your Karma. Choosing between being judgmental or adopting a ‘maybe’ mindset affects your Karma. Learning from what happens to you, turns an event into experience. You can’t control life events, but you manage how you react. That’s why Tibetan monks celebrate destroying a Mandala even though they spent weeks building it. The sand painting representation of the world in a perfectly balanced divine form is not the reason to celebrate — letting go of their creation is. A ‘maybe’ mindset is not about being doubtful or insecure. Learn to accept that everything in life comes and go. Understanding that what today looks perfect might become flawed tomorrow. And the other way around. 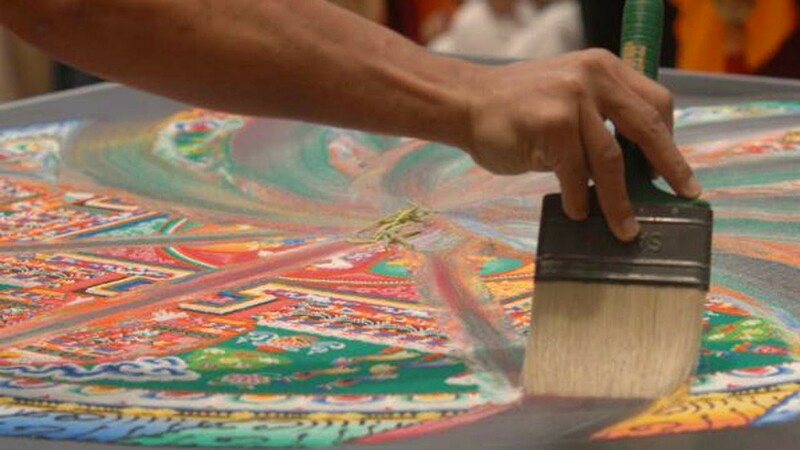 Millions of colored pieces of sand can become a beautiful Mandala. The joy of getting a new horse can turn into a painful experience as it happened to the farmer’s son. Follow these tips to embrace a ‘maybe’ mindset. Accept reality rather than fight it. Resist self-sabotage by choosing not to live in the illusion of how things should be. When you stop expecting, you start accepting. Things are not either good or bad, they simply are. Become your reality best friend. Don’t let self-pity get in your way. When we judge others, we allow our lack of compassion to take over. We all judge, it’s in our human nature. But, becoming more aware of it, can minimize its frequency. We criticize in others what we don’t accept about ourselves. Our intolerance or impatience is why we shut others down. When we judge other people it’s because we believe we are superior to them. Accepting your own flaws will reduce your need to judge others. Learn to silence your inner critic. Every event in life is connected. Incidents are not isolated, but part of a continuum. Don’t get stuck in a moment because it was perfect (or not). Your life is in constant motion, just like a wave. The rhythmic movement that carries energy is what creates waves. They have high-points — the crest — and low-points — the trough; just like your life does. Enjoy each ride. Rather than expecting from the perfect wave to show up, make the best out of what you get. Learn to surf whatever life throws at you. Embrace your reality and stop waiting for luck to come up to help you. If life throws you a perfect wave, enjoy it. But don’t expect every ride to be a point break. Garbage in, garbage out. Your Karma is a by-product of how you decide to live your life. If you want to collect, you must invest first. Remember, you build your own Heaven and Hell. You have control over your Karma, but you don’t have control over fate. Own your Karma, not just the consequences, but what you put out. When in doubt if something will help you, always choose maybe yes. Neither joy nor pain last forever. A ‘maybe’ mindset will help you keep a more positive outlook on life. You cannot control how events will turn. You shouldn’t judge a situation either. Or react to every incident for that matter. Wait for the outcome to unfold (remember the farmer’s story). Focus on your part. Do your work, maybe the results will happen.